There are some times I miss you more than others, Mom. Today was one of those days. Even though you’re no longer here, I truly believe you know that your granddaughter Ashley and her long-time boyfriend Chris were married a little over six months ago. I wish you could’ve met him. I know you’d love him as much as we all do. They’re absolutely perfect for each other. They have the same temperament. The same likes and dislikes. They balance each other. I knew from the first few dates they had, that they’d end up together permanently. There really wasn’t any doubt. Although some may think I’m a bit crazy, I believe you and Daddy, and the rest of our family who are with you in heaven, were given the gift of seeing their wedding. There were times that day I felt your presence so strongly….like you were there giving them your blessing, as you squeezed my dad’s hand and told him how proud you were of your granddaughter…how much you loved her. Did you see the charm on her bouquet? 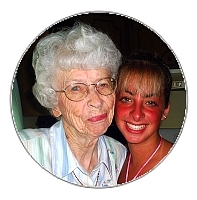 With that picture of you and her in your kitchen…with her sunburned face as she smiled at you? That’s one of her favorite pictures of the two of you. Today was a special day, and one that I would have so loved to have shared with you. I’m sure you already know that our baby, your granddaughter, and my daughter, is having a baby of her own. I’m sure you knew it before I did, and probably before Ashley and Chris did. In fact, as Ashley said earlier, you already know whether it’s a boy or a girl. And you’re not telling us, either. 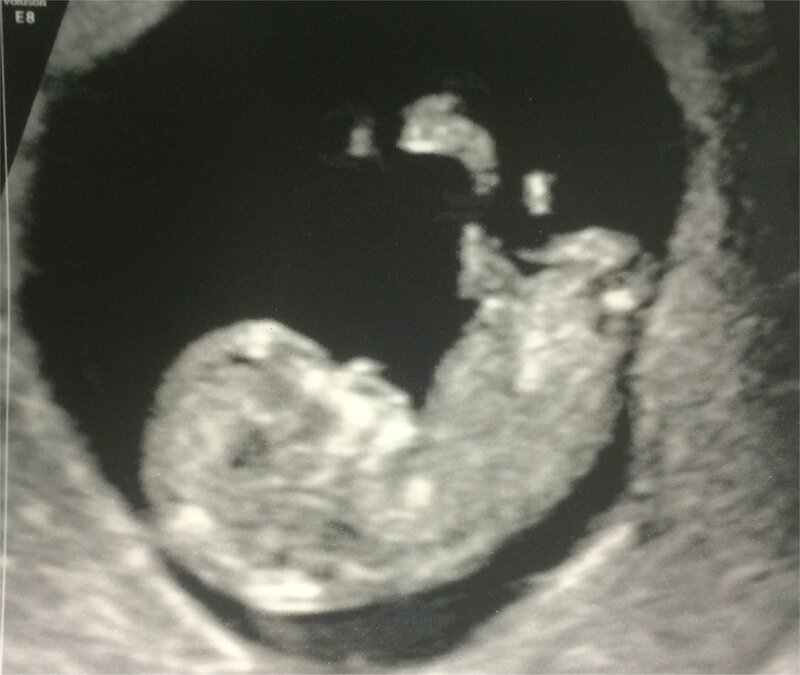 A few weeks ago Ben and I were able to join Ashley and Chris as we saw the first ultrasound of our grandchild. That was an awesome moment. Watching the two of them as they saw the first glimpse of that new life they created…I cannot even begin to express my thoughts. Ben and I were both a bit teary eyed. Ashley and Chris were just amazed. It was still a bit hard to believe. But today. A month later, it was so different. It was just Ashley and me in that ultrasound room. Chris was at work, and so was Ben. I watched as the technician moved that wand around on my daughter’s belly, and that little darling grandchild of ours…your great-grandchild…was there just lounging around. Once in a while the legs would kick, or the arms would wave. This time, that little baby who’s only an inch and a half long, was clearly visible as a baby. A new life…not just a collection of cells, but a little person coming into being. I so would have loved to tell you how I felt…to share that moment with you. I wanted the three of us…three generations…to be involved. I wondered how you’d felt when you found out I was having a baby. How you felt knowing your baby was having a baby of her own. Because that’s all I could think about. My baby that I carried for nine months was now carrying a baby of her own. Jeremiah 1:5 tells us “Before I formed you in the womb, I knew you, before you were born I set you apart…” The Lord already knows all about this little person. What he or she will look like. What he or she will do with their life. And I believe the Lord has already filled you in, Mom, on all of it. And you and Daddy are even more excited about all that your first great grandchild will be. And you’re excited for all of us as well! Yes, today was one of those days I have missed you more than I can even express, because there are just those times that I need my mom to talk to and share special moments with. Mom, even though I can’t tell you in person, I just want you to know how excited I am. I think I can finally almost imagine how you felt when Ben and I told you that you were finally going to be a grandmother.